Chinese smartphone brand Realme recently introduced the Realme 3, a successor of company’s affordable performance-centric smartphone, the Realme 2. Pitched to be a competitor of the Xiaomi Redmi Note 7 and Samsung Galaxy M10 (review), the Realme 3 has decent hardware, dual camera module on the back, gradient starry design, and waterdrop notch screen. The Realme 3 ditches the diamond cut pattern that was introduced by the company in most of its previous devices. However, it compensates the design change with a new starry gradient pattern profile covering the entire back. The rear panel curves all the way to the sides around the frame and meets the glass on the front. It is made of multiple laminated layers that give it a glass-like glittery profile. Though the phone’s back panel with gradient starry design looks dazzling, it is prone to smudges and is a fingerprint magnet, therefore, needs regular cleaning. Thankfully, the phone comes with a silicone case that fits perfectly and saves the phone body from accidental scratches. The Realme 3 has a 6.2-inch screen of HD+ resolution. The screen sports dew drop notch on the top, accommodating front camera. The screen looks vivid, but falls short on brightness, leading to average sunlight legibility. Unfortunately, the phone does not support Widewine L1 certification required to stream video content in high-resolution from over-the-top platforms such as Netflix and Amazon Prime Videos. Therefore, the screen looks pixelated while streaming videos and shows online. The phone is powered by MediaTek Helio P70 system-on-chip (SoC), paired with 3GB of RAM and 32GB of storage or 4GB of RAM and 64GB of storage. The phone boast dedicated storage expansion slot, which supports microSD card of up to 256GB. Though the phone falls short in rendering HD multimedia content, it handles graphic intensive games such as PubG and Asphalt 9 well. The phone does show thermal issues as it gets warm after extensive gaming sessions. In handling average day to day tasks, the phone feels sleek and snappy. It shows no lags while browsing the internet with multiple tabs open and handling multiple apps active in background. The phone boots Android 9 Pie-based ColorOS 6.0, which is a heavily customised user interface that might not please everyone. Powered by a 4,230 mAh battery, the Realme 3 comes with a regular 5V/2A charging support. The phone has a micro-USB port for charging and data transfer, which is standard in most budget smartphone. The battery lasts for around a day on regular usage, including browsing the Internet, streaming videos, handling social media apps and casual gaming sessions. The Realme 3 has a dual camera module on the back, featuring a 13-megapixel primary sensor and a 2MP depth sensor. On the front, it has a 13MP lens that support artificial intelligence-based beauty mode, group selfie mode and AR stickers. 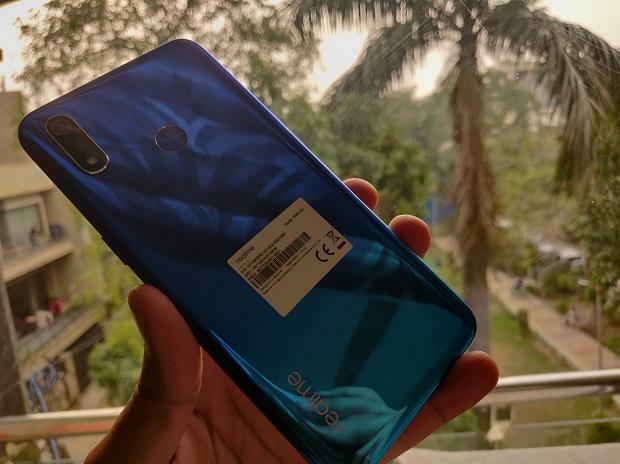 Interestingly, the Realme 3 has a dedicated Nightscape mode and Chroma Boost mode – camera feature that no other phone in its price segment offers. The Nightscape mode is aimed at improving low light imaging. It does make noticeable difference in shots taken low light. The Chroma Boost mode uses AI to recognise a scene and adjust better dynamic range, contrast and exposure. The dual rear camera setup works well in adequate lighting. The shots captured offer good detailing and the colour reproduction is natural. However, the camera struggles in low light. Shots captured in low light look bit grainy and off-colour. The same seems to be the case with the front selfie camera, it does a good job in good lighting conditions but struggles in low light. What is good about the front camera is the AI mode and the beautification features that work well. These modes make the photos look better without the subject looking unnatural.